In the early stages of recovery, you’re learning new ways to cope with everyday situations. Developing healthy habits is a big task, especially during the holiday season. 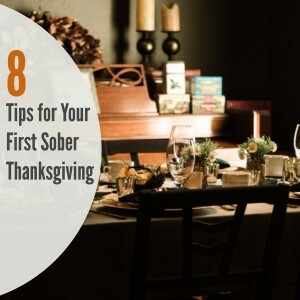 If this will be your first sober Thanksgiving, stay on the path to recovery with these 8 helpful tips. Thanksgiving is all about counting your blessings and there’s no greater blessing than being in recovery. Writing down your blessings in a journal is an excellent way to remind yourself of your commitment to your sobriety while getting into the spirit of the Thanksgiving celebration. Sending personal notes to those who’ve helped with your recovery is another great way to show your gratitude. Even if you don’t consider yourself to be a natural born writer, you can’t go wrong with a heartfelt note of appreciation. 2. Start a New Tradition. If drinking is normally a big part of your Thanksgiving celebration, consider this year an opportunity to start a new alcohol-free tradition. You could organize a team trivia contest, play a friendly game of flag football, create a silly photo booth complete with assorted costumes and props, or give back to your community by volunteering at a local homeless shelter. There’s no right or wrong way to celebrate Thanksgiving, as long as you’re making memories with the people who mean the most to you. 3. Make Plans for Self-Care. If you’re struggling with depression or social anxiety, crowded holiday gatherings can be overwhelming. Even if you’re genuinely excited to see everyone, a packed room might be hard to handle. Taking the time to meditate or engage in some relaxing yoga poses before the event begins is an excellent way to keep stress levels in check. Bringing items to help you calm down, such as headphones and relaxing music, calming essential oil spray, or a fun mini adult coloring book, can also be helpful. 4. Don’t Throw Good Nutrition Out the Window. While Thanksgiving is a time to indulge, keep in mind that healthy eating habits help support your recovery. Start your meal with a salad packed with fiber rich veggies, choose moderate portions of your favorite entrees and side dishes, then finish with a special dessert. Make a point to eat slowly and give your full attention to your food so you can savor every last bite. One common mistake that people make when planning their Thanksgiving holiday is coming to the feast on an empty stomach. If you let yourself get too hungry, you’ll be more likely to eat to excess. Being hungry can also make it harder to regulate your emotions and control your cravings for drugs or alcohol. 5. Bring Your Own Beverage. Ideally, your host should provide a non-alcoholic beverage choice for guests who don’t drink. Unfortunately, this is a detail that not everyone remembers. Avoid a sticky situation by simply bringing your own non-alcoholic beverage option. Sparkling cider, herbal tea, flavored water, or a fruity non-alcoholic punch are excellent beverage choices for a Thanksgiving meal. Bring enough to share and you may find yourself surprised by how many guests decide to spend the day sober with you. Keeping yourself busy throughout the event will help calm your nerves and reduce the intensity of any cravings you might have. Volunteer to help set the table, put the finishing touches on a few side dishes, or entertain any impatient young children. Your helpfulness will be appreciated and you’ll make new memories in the process. It’s common for 12 step programs to host multiple meetings throughout the holidays, so there’s probably one near wherever you are traveling. Connecting with others in recovery can help you stay on the right path. If desired, you could use this opportunity to invite a supportive friend or family member to attend an open meeting with you. 8. Plan an Escape Route. Hopefully you won’t need to use it, but it’s always a good idea to come up with a graceful way to exit a situation that starts to feel like it’s just too much. Consider having a friend on standby who can send a text or call with an “emergency” that lets you leave the party early if needed. Another easy way to exit a situation is to simply inform everyone ahead of time that you have another appointment later in the day and will need to leave early. This strategy works well for situations where you know that you won’t be feeling up to socializing for the entire event. If you or someone you love needs addiction treatment, please call St. Joseph Institute at 888-352-3297.